This post is one that is long overdue. My original plan was to do an in-depth review of not only the stainless steel Live in You ShiYou pens, but also its gold nib variants. However, entering the year 2019, no news yet for that release. Ultimately, I was told by Eason that he sold the brand to a big stationery conglomerate in China, and those tasty 18k A.G. Bock nibs are resting in the warehouse waiting for the day to be shipped out as a beautiful show item for the new owner’s chain store rather than something for sale. Thus I can’t stop worrying about the fate of the ShiYou model. Yes, they are large, beautiful and highly refined. Wherever I went with these three pens, I gained a considerable amount of appraisal. The ShiYou pens presented me with the highest precision and delicacy I have ever seen in a modern acrylic fountain pens in the sub-100 category. By comparing the lathe traces left inside the barrel, the tools and quality standard used to machine the ShiYou pens seem to be higher than the 120-dollar Opus 88 demonstrator–while the inside of the Opus is frosted and slightly marked by the lathe, the inner surface of the ShiYou features a circling pattern with a consistent and minimal trace. The medallion sits on the flat top is also a great differentiator from other acrylic-based ones. While both of the previous iteration of Live in You’s acrylic pens, the MiTu, and Future series, all suffered from the uncomfortable gripping; the ShiYou has finally solved that problem. The nib section is well tapered and transited from the barrel, housing a #6 Schmidt nib, the same standard adopted by the Unseen series (or the Retro 51 fountain pen). With its business end fixed, the ShiYou finally become a Live in You pen that supports long session writing. The lack of shortcomings in the ShiYou pens makes me want to use this pen more than any other Live in You pens. There is less to say about the inside of the pen, which are more or less in line with what you would expect of a fountain pen of this form factor: there’s a #6 Schmidt, a Schmidt entry-level converter, the iconic metal sleeve that allows the nib unit to fit into and adjust freely, and a small O-ring that prevents the ink getting into the nib section during filling. While Live in You isn’t offering a medallion on the side of the body, it includes a helpful “pen rest” in the box. The pen rest comes in the same material as the pen’s, and it can stopped any pen from rolling over on your desktop. It is noteworthy here that the ShiYou pens strikes a surprising resemblance to the Kanilea Pens. To be honest, the overlapping between the ShiYou and Kanilea’s offerings bothered me a lot. Interestingly, when I presented this pen to Hugh Scher during the 2018 DC Pen Show, he was taking this pen more like a salute, rather than a blunt copy. Recently, when I spotted this Herbert x Goulet pen, I came to realize that the trend of sizeable straight cylinder shape is never an exclusivity for any specific brand, and pen makers have been cheating on this form factor for years. How many brands can you think about for a torpedo shape pen? Recently, new colors of the ShiYou came out, and they look even better. However, still, the lack of alternative nib options and the indefinite postponement of the gold nib version restricts the popularity of this model. The ShiYou only comes with an EF Schmidt nib, and adding another nib unit by yourself makes this whole package exceed the 100 dollar price tag. 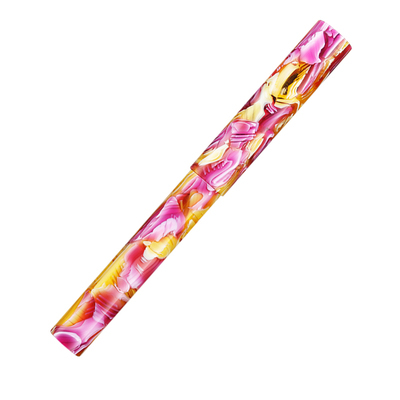 There are too many alternatives on the American fountain pen market for a big acrylic pen, and you must be a die-hard fan of the pen blanks used chosen for the ShiYou pens, or you would get regrettable very easily. For example, the Opus 88’s new pens would be a powerful competitor for the ShiYou and other similar pens in this range. For the domestic market of China, the ShiYou’s potential buyers might be persuaded by Green Stationery’s Wing Sung 627 which offers a replacement nib right out of the box or a Moonman M100 which costs a fraction of ShiYou’s hefty price. To make things worse, there is a fatal design flaw inside the nib section, see the update in the end of the article. Key take away: do not twist the o-ring on the nib unit and make sure you screws it back properly. To sum up, the ShiYou shows another step forward for the Live in You brand, and if compared side by side with a full-size Franklin-Christoph or Edison Pen Co’s pen fitted with an EF nib, the gap is closer than ever. However, ShiYou’s competitiveness is in-doubt and the company should do more to fending off followers that are both aggressive and capable. Paying tribute to leaders like the Kanilea doesn’t hurt, but it also doesn’t help in setting a clear and stable image for itself when viewed from an international arena. Sadly, for the rest of 2018, ShiYou has been acted as the premium lineup for the Live in You brand, probably as the direct result of the merger into the Picasso’s family. The company recently released its long-awaited Mountain Series to the domestic market. It features a combination of the same writing unit with delicate trims and classic fountain pen looks. The edged, sword-like pen clip looks great, but the Moonman M100 has already realized it. Thus the mini emboss on the cap band that depicts the wilderness of mountain becomes the only differentiator for the Mountain. What brings me a bad feeling about the future is the pricing scheme for it. Believe it or not, the Mountain Series was priced around 46 dollars domestically on launch, only half the price of a ShiYou. I am not sure whether it is an intentional move by the new owner of the company to move the inventory or simply a pricing error, but this price tag could shack the ShiYou’s value proposition easily. In reply to Chris’ comment on the issues he had with the ShiYou pens, I double checked all of mines and did found one in common. The issue of interference from the section during the capping. I didn’t encounter this issue on any of my ShiYou pens. But last night I found I was having the same issue with the ShiSan (No.13). It was almost impossible for me to get the section in and out without a considerable amount of force. However, since I had no issue with that very pen before, there should be other reasons for this issue. Soon I found out that it was the twisted O-ring inside the section that caused the distortion of the section. Right: Normal position of the nib unit; Left: A twisted o-ring that distorts the shape of the section. The model ShiSan was the only one that I dissembled during my review, and I can remember when I was trying to put everything back, I accidentally remove the o-ring in the front of the Schmidt nib unit. It took me a while to get it back. Since the nib is too wide for the ring to go through, thus the only way for me to fit the o-ring back is to approach from the back, which turned out to be too long a travel for the rubber ring that during its way up to the top, uneven twists and rolls are inevitable, resulting in a twisted o-ring that is thicker than the original setting. But on a bigger scale, this change of dimension is hard to notice. During the past days after my review of the pen, the o-ring has successfully made to enlarge the diameter of the front of the nib section. Sad. I think there are two design flaws here: one is that the nib-unit should have better material for the o-ring that is less prone to twist, the other is that the pen maker should have calculated the possible redundancy needed for the possible expansion of the section. While I am not sure whether the o-ring is fitted by Schmidt or not, I can’t agree with Chris more that they could do better in ensuring good quality. Since I don’t have o-rings around me, my current homemade solution is to use dental floss to replace the o-ring. Although the dental floss would soak up some ink during filling, this could stop more ink from getting inside the section. But if you really ask me, I have to say it is still different from the factory setting. Maybe the material has been under pressure for too long and the change of dimension is irreversible now. I had an opportunity to use 4 of these at Goldspot’s meetup last week. I love the resins but I did not find the quality to be up to the standards you describe. One pen had a section not machined well & interfered with capping the pen. Others had cap threads that resulted in rough capping. Not good for a Chinese pen in this price category. Using a #6 nib & suitably sized section is a big improvement. Offering only an EF nib is not. Great insights into LIY future. Will be interesting to see what models come from them. Thanks as always Chris! Guess what, I am having one of the issues now. As for the rough capping one, so far mines are good, let me see the pens in concern if possible in the future. Again, insightful comment! You mentioned the O-ring issue — is it only an issue during complete disassembly? I think the pen looks fantastic – would it be fairly easy to switch out just the nib unit? That pen looks beautiful! You mentioned a problem with the o-ring; is it only an issue if you’re completely disassembling the pen? I was thinking of buying the pen and maybe just switching out the nib with a titanium one from Bock. Is that doable or difficult? The video review says Jowo nibs aren’t compatible without modification, but I was wondering if Bock was okay.